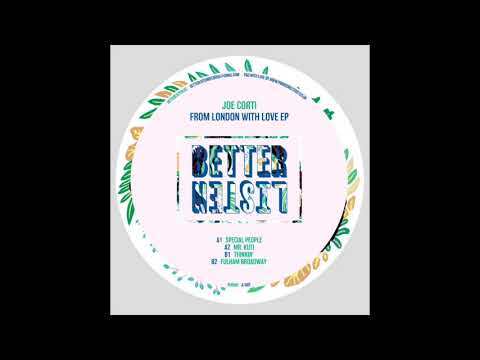 Better Listen Records continues its hot streak into 2018 with a debut EP from Joe Corti (soundcloud). The young Londoner’s short discography is off to a strong start with singles on the always good Pusic Records, the always sleazy Mr. Nice Guy Records, and now a proper artist EP on one of America’s most promising underground house labels. Comprised of carefully selected samples and exciting arrangements, From London With Love shows off Corti’s ability to dig out timeless samples for the dancefloor and weave them into a DJ’s dream. Special People and Mr. Kuti make up the rowdy, percussion-filled A-side, while Thinkin’ and Fulham Broadway go a little deeper into disco territory — keeping in line with the label’s roots. Special People and Mr. Kuti are definitely cut from the same cloth, both containing a myriad of elements organized into hard to pin down but nevertheless emotionally engaging tracks. The repetition of the samples at play could easily get stale but, as the lyrics cleverly float in an out of understanding, one forgets about the message, sticks to the feeling, and keeps on dancing. Thinkin’ switches up the formula in favour of strings, cheers, and smart filtering. Rounding things off is Fulham Broadway, a funky number full of syncopated hits and an oh-so-sweet bassline. The tracks here could be from almost any era of which conveys a maturity beyond the producer’s years. From London With Love is out on vinyl January 26th and you can pre-order it here.